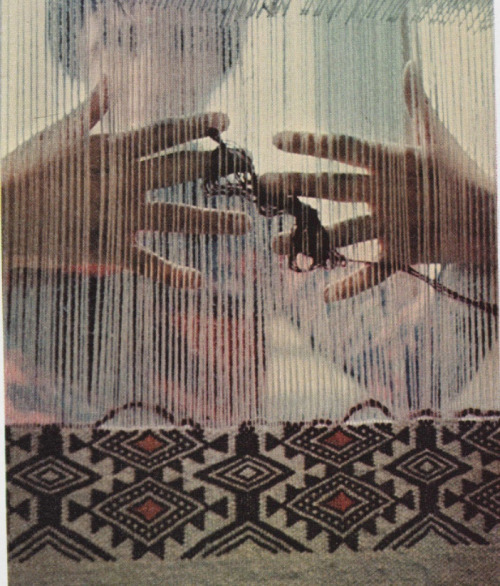 Kabyle woman weaving a rug. From www.nationalgeographicscans.com. Let’s visit the Tamazight culture in North Africa to explore the theme of Natality. After an overview of Tamazight biocultural heritage, we check out its culture through myth, ritual, sign and symbol. The popular and masculine form used almost world-wide, namely “Amazigh Language“, does not exist, violates the sacred Tamazight, and [is] seemingly heading towards threatening the very base on which it was founded – the matriarchal nature of the whole Berber society. Tamazight by itself means exactly that: ‘Berber language’. Full stop. For some unknown reason, there seems to be a trend to abandon the original matriarchal form ‘Tamazight’ and ultimately all its associated forms (Nesmenser, 2014, np). I choose to use ‘Tamazight’ to describe the culture as well as language because it is inclusive and recognizes the ideology of matricentric culture embedded in the language. I use ‘The Amazigh Movement’ to refer to the contemporary cultural and political movement in recognition that this is their chosen name. I recognize that the global community of scholars uses the term ‘Berber’ as synonymous with Tamazight, however most Tamazight people reject this term as a pejorative that perpetuates the indignity of a ‘barbaric’ identity imposed by invaders and colonizers, similar to ‘Indian’ in Canadian English. The Tamazight culture is difficult to describe because so much of our knowledge comes from non-North Africans who viewed North Africans as “other”. Like the Basque, Tamazight is one of the oldest indigenous cultures of the world, speaking one of the oldest languages. Rock paintings of abundant wildlife, domesticated animals and chariots, indicate a complex culture dating to at least 10,000 BCE. The cave paintings at Tassili n’Ajjer and other locations depict vibrant scenes of a hunting people who lived in a savannah-like environment. When the Sahara became desert around 3000 BCE, its population became destabilized, forcing migration to river valleys to feed their people and herds. The Tamazight are a culture that has adapting to climate change since 3000 BCE and their survival story has much to teach us. Tamazight culture covers a vast region of Northern Africa from the coastal plains of Morocco in the west to Nile Valley in the east, from the Mediterranean coast up to the Sahel savannahs in the south. Tamazight populations can be found Egypt, Libya, Tunisia, Algeria, Morocco, Mauritania, Burkino Faso, northern Niger and northern Chad. Tamazight culture is heterogeneous, comprised of several ethnic groups including Tuareg and Kabyle (see map of Tamazight cultures). In the Holocene Period, North Africa was subject to alternating wet and dry periods, explained by the Saharan Pump Theory and the Bond Theory of kiloyear cycles. During the last wet period, called Neolithic Subpluvial (~3500BCE), the Tenerian Culture flourished in the Sahara, developing agriculture, cattle herding and pottery in a green savannah on the shores of wide rivers and large lakes. For unknown reasons, the wet/dry cycle was interrupted indefinitely and there have been no wet periods since the 5.9 kiloyear event. By 3000 BCE, the Sahara was completely desertified and continues to grow at the rate of 1.5 km per year. Desertification compelled Saharan peoples to migrate or return to nomadism. Diverse groups had settled along the Nile in periodic dry periods over previous millennia, producing a cultural crossover. Egypt began to emerge as a nation-state around 3100 BCE when Narmer unified people of the northern Nile (Saharan/Libyans) and people of the southern Nile (Nubians). I conjecture that the driver for unification was not resistance to the cultural differences of ‘newcomers’, but a sense of protecting the land and entitlements of ‘old timers’ while controlling the chaos of hungry, desperate Saharan refugees. Over time, political stability and intensive agriculture freed a sizable portion of Egyptian population from food production so that they could invest their labor in monumental architecture and in political, military and religious affairs (Giblin, 1998, np). The achievements of Egypt’s Naqada III period, specifically writing systems using hieroglyphs and serekhs, irrigation systems and sail navigation, were possible because there was a stable society free of anxiety in which innovation could flourish, corroborating Haarmann’s theory that when cultural life unfolds according to the rhythm of natural cycles, then collective knowledge is oriented toward improving living-conditions in that environment (Haarmann, p.220). While the controversy for eurocentric scholars is whether ancient Egypt was African, the controversy for Afrocentric scholars is whether ancient Egypt was a secondary civilization built on the legacy of a Proto-Saharan civilization that had become destabilized due to desertification. Cheikh Anta Diop remarks on the close resemblance between the languages, mythology and art of Egypt and Saharan Africa where the key difference is that Egypt developed a centralized culture, in contrast with Saharans’ preference for local autonomy (Giblin, np). Diop suggests that the people that remained in the Sahara did not have the organizational capacity to be the “starting point of a civilization” until the Phoenician period (Diop, 1974, p.65) but this conclusion discounts the Garamantes civilization. “Many archaeologists today believe that the Garamantes and their ancestors were responsible for the rock art of Tadrart Acacus, the Messaks and the surrounding areas, most of which spans a continuous period of history going back, at least 12,000 years…Archaeological artefacts and stone tools discovered in various sites from Fazzan were definitely dated to the late Acheulean and the Aterian cultures” Nesmenser, np). Afrocentrist Clyde Winters, in The Black Greeks, posits that, by 3000 BCE, the Garamanteans from the Fezzan had founded cities in Thrace, Crete and Attica, and had transmitted North African mythology to the pre-Hellenic Greeks (Winters, nd, np), but his conjectures lack rigour and have not been corroborated by other scholars. In 2200 BCE, the 4.2 kiloyear event abruptly plunged the Tamazight into a great drought that caused many cultures to collapse, including Egypt’s Old Kingdom, Akkadian culture and Malta’s megalithic culture. Their struggle to survive made them vulnerable to colonization by Egyptian Pharaohs, Canaanite traders, Greeks colonizers, the Roman Empire, Vandals, the Arabs and finally by the French and the Spaniards in the 19th and the 20th centuries. These constant assaults were devastating to their culture and identity, because the colonizers did not call them Tamazight, but imposed a different identity on their land: Meshwesh (Egyptian), Libya (Greek, see Herodotus’ Map of the continent of Africa), Numidia (Roman), Berber (Vandal) and Maghreb (Arab). During the Arab period, many Arabs moved into North Africa, producing an admixture. Today’s Tamazight are still trying to reclaim their identity by deconstructing the colonialist attitude that Berbers are inherently disunited and unstable. In 943 BCE, Libyan-Egyptian relations reached a peak “with the founding of the Pharaonic Libyan Dynasties by Sheshonk I, from the Libico-Berber Meshwesh tribe, who had wrested control of the state from the previous dynasts”. They ruled Egypt for more than 200 years – an event of symbolic significance for modern-day Tamazight “memory workers” who fashion their contemporary identity by salvaging the achievements of their past. “The symbolic importance of the ascent of Sheshonk I cannot be overstated, for according to Berberist understanding, it marked the moment of entry” of their people “into recorded history” (Maddy-Weitzman, 2011, p.15). Tamazight in the language of culture: myth, ritual, sign and symbol. Juno Caelestis, the synthesis of Roman Juno and Tanit. Image by M Rais. Hvidberg-Hansen (1986) and Albright (1968) observe that Tanit-Astarte shares many attributes (and perhaps her name) with Anat. When the Romans conquered the Canaanites, they renamed Tanit to Juno Caelestis and dedicated the Maltese temple at TasSilq to her (Stuckey, 2009, np). 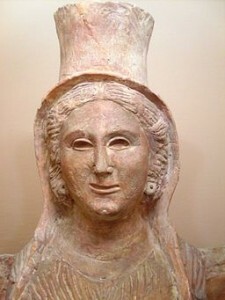 Tanit was the primordial deity in Africa: “the eldest, mother of the gods, who illuminated the first face.” She was “unequivocally portrayed as autogenetic / parthenogenetic Creatrix” (Rigoglioso, 2010, p. 23). She is the “first conscious Act of Creation from the Void, who takes the inert potential of Nun and causes creation to begin” (Griffis-Greenberg, 1999, np). The Primordial Mothers have common attributes because they are one and the same, with minor cultural distinctions: Tamazight Tanit, Libyan Neith, Canaanite Anat, African Isis, Greek Athena, Akan Ngame and more. Her name may be derived from netet meaning “to knit, to weave” (Dexter, 1990, p.24). 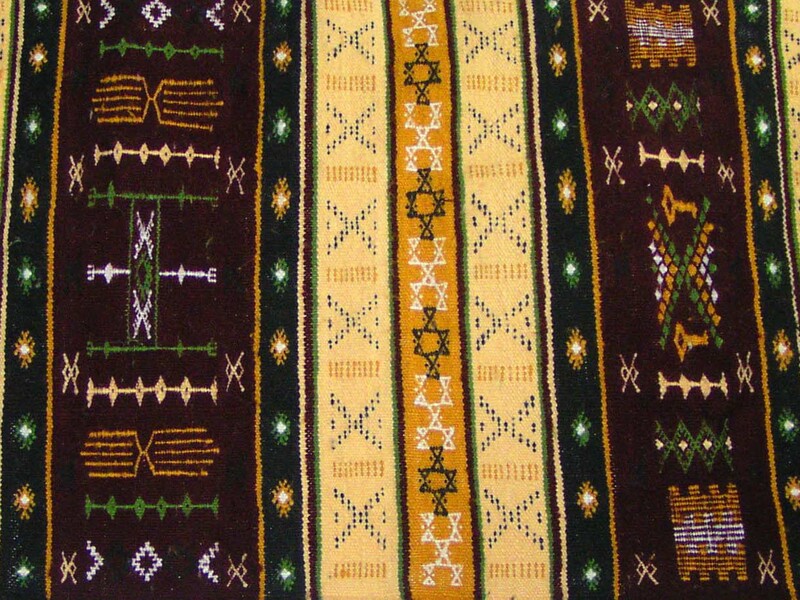 Tanit wove the world on her loom, and her icon often includes a loom symbol. As patron of weavers, she provided the linen bandages used in mummification and the respectful care of the dead. Today, each weaver’s weaving is symbolic of her becoming, a continuation of the parthenogenetic power of The First Principle. Ancient rock engraving of a female archer from Wadi In Habeter, Libya. As “Mistress of the Bow” and “Ruler of Arrows”, Tanit used her bow and arrows to govern the skies. Known as the “Ever-Ready Shooter”, she gave life to humans and all living things on earth by shooting particles of her vitalizing moon fire into infant bodies in the womb (Rigoglosio, p. 27, 42; Griffis-Greenberg, np). As “Opener of the Ways,” Tanit opened the cosmic pathways so that new life could be born. She opened the birth canal so that an infant could be born, and she opened the gates to the underworld so that deceased souls could find their way (Iles, 2007, np; Griffis-Greenberg, np). Ancient astronomers knew her as “Opener of the Sun’s Paths in all Her Stations”, notably the equinoxes and solstices. As a moon goddess, Tanit marked the cycles of women’s fertility. According to Herodotus, the ancient Libyans worshiped the moon and sun. In Tunisia today, it is customary to invoke “Oumek Tannou” (Mother Tannou) to bring rain. How does this mythology of Tanit support matriculture? Ifi Amadiume concurs with Diop that motherhood is central to African culture but she critiques Diop’s theory of matriarchy for its basis in a matrilineal descent system and neglecting to recognize that matricentrism reflects a core societal value in which motherhood has wider socio-political expression: “the traditional power of African women had an economic and ideological basis, which derived from the importance accorded motherhood” (Amadiume, 1992, p.112). Following Amadiume, I posit that the ancient North African mythology of Tanit is the foundation of a matricentric or matricultural ideology, a core value that shaped many indigenous cultures on all continents. Greek historians Herodotus (484–425 BCE) and Diodorus Siculas (circa 60 BCE) reported that many deities in the Greek pantheon originate in North Africa. The Greek myths of Poseidon, Tritonis, Antaeus, Libya, Medusa, the Gorgons, Atlas and the Hesperides are all situated in North Africa (Nesmenser, np) and many have Amazonian sub-themes According to Haarmann, the usefulness of the knowledge must have been collectively acknowledged and appreciated by the Greek community, and thus the knowledge had intergenerational potential (Haarmann, p.206). Plutarch, Diodorus and Herodotus wrote that Neith’s birthplace was Lake Tritonis in Libya (North Africa) and that she was adopted by the Greeks as Athena. They confirm that Lake Tritonis was also the traditional homeland of Queen Myrina and the Libyan Amazons (Rigoglioso, p.56), and for this reason, we must pay attention to Neith’s link to the Amazons as historical women. Tyrell regarded the Amazons as a “foundation myth” to reinforce patriarchy (Tyrrell, 1984, p.123). Gerhard Pöllauer, founder of Amazon Research Network, suggests a Tamazight etymology for Amazon to denote indigenous African matriarchal culture (Pöllauer, 2014, np), and that this meaning was understood by pre-Aryan Greeks, but later denigrated by Aryan-Greeks to describe the warrior women of the Black Sea. Diop posits a Greek etymology for Amazon (a-mazos = without breast) and perpetuates the bizarre misogynist myths of breast-severing and husband abuse (Diop, 1990, p.119f). The mythology of Tanit provides the ancient matricentric foundation for Tamazight culture. The Amazonian legends can be interpreted as explanations of matriarchal culture. Dr. Malika Grasshoff, a Kabyle/Tamazight woman, describes the centrality of women in the ritual life of the Kabyle: “From the cradle to the grave, the woman as mother is the protector of life; she is the potter, the provider, the weaver of human bonds (Grasshoff, 2009, p.187). The adoration of the mother is expressed as ancestor veneration and in rituals performed for nature in order to create a spirit of unity with the ancestors and all of life (p.180). As a young girl growing up in Kabylia, Malika Grasshoff learned the secret code of women that is incorporated into pottery decoration. “It took a long-lasting initiation by old women-potters in the ’80s to actually enable me to decipher the symbols that can only be truly appreciated by women because they relate directly to femininity and maternity” (p.178). The ritual life of Kabyle women emphasizes reverence for mothers and maintains the matricentric structures of the culture, even in the face of continued Arab/Muslim oppression . “These rituals have been preserved in the life of women. They can be called magical, because they mirror the cosmic creation in human procreation. In this way women see themselves not only as creatresses of human life, but also as a symbol of the creative power itself. Therefore they see uniquely this creative and magical power in everything they themselves have created.” (p.188). Grasshoff’s story illustrates Haarmann’s theory that when cultural knowledge is enacted, it has demonstrated its usefulness in sustaining communal life (Haarmann, 2007, p.201) and reflects an indebtedness to the ancestors (p.213). The Kabyle and Tuareg have maintained traditional matricentric values more than other ethnic groups. In the next sections on symbol and sign, we will explore how arabization erodes the cultural meanings assigned to symbols and signs in public places. Tamazight rituals enact, through symbols, the link to ancient beliefs (myth) which are foundational to matricentric values. Where Tamazight groups, like the Kabyle, follow matricentric practises, rituals serve to honour the ancestors and to teach future generations the sacred symbols and beliefs that are embedded in textiles and pottery designs. Dr. Cynthia Becker, African art historian at Boston University, contributes significantly to the Western record of the visual arts in North Africa;l her critical perspective steered me away from romanticizing Tamazight culture. Due to the Saharan crisis of sustainability and modernization, some Tamazight cultural symbols are no longer useful, and are therefore no longer part of cultural memory, for example, Tanit’s symbol of bow and arrows, which held three meanings: war, the hunt, astronomy. In contrast, Tamazight culture has retained knowledge of Tanit’s gender icon to communicate its matriarchal foundation: the triangle (pubic triangle) with the oval (womb), illustrated in many variations. Cynthia Becker lauds the work of historian Gabriel Camps in analyzing the Berber signs and symbols of pre-Islamic beliefs. He compared patterns from material culture from excavations dated 8000 BCE with contemporary Berber textiles, pottery and henna tattoos. He collected the names assigned to Berber motifs in order to recover their original meaning and found that triangular or diamond motifs were symbols of Tanit (Becker, 2010, p.205), zigzag lines symbolized rainfall and containers symbolized fertility as they hold water, grain and olive oil. 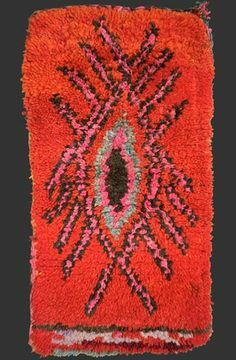 Becker concluded that authentic Berber art is made of aesthetic forms that have remained unchanged for millennia; it is unconscious, tribal and matriarchal (p.212). Tamazight women are engaged in the arts as an expression of ethnic identity, and not surprisingly, the arts have become visual expressions of matricentric values. “Controlling the visual symbols of Amazigh identity has given these women power and prestige. Their clothing, tattoos, and jewellery are public identity statements” (Becker, 2014, np). In 1980, a violent intervention by Algeria’s arabist government interrupted a planned Kabyle cultural event and ignited the Kabyle region of Algeria, sparking a general strike, prompting demands for Tamazight language instruction in public schools and birthing an international Amazigh Movement. The tragic event is commemorated annually on April 20th by The Amazigh Movement worldwide (Hagan, nd, np), but by 1993, Tamazight identity had not yet been recognized constitutionally by any North African government. In the Arab Spring of 2011, Tamazight groups helped to oust Gadaffi who had spent years suppressing Tamazight culture in Libya. Finally, in 2011, Morocco enacted a new constitution that enshrined Berber as an official language, alongside Arabic, but there has been little change in public policies except that public schools offer instruction in Tamazight. In Morocco and Algeria, the visual arts have become an important means by which The Amazigh Movement re-constructs a Tamazight identity, but in doing so, many artists/activists perpetuate the French colonial stereotype of the Tuareg matriarchal nomad and Berber freedom fighter (Becker, 2009, p.95). Reclaiming the goddess Tanit and an ancient religion that lauded women is manifest in The Amazigh Movement’s ideology that women are guardians and carriers of Tamazight identity and their traditions. The Amazigh Movement’s integration of women is linked to the ideology that prior to the arrival of Arabs, Tamazight cultures were largely matricentric and the imposition of Islam resulted in female oppression and the loss of language, culture and indigenous religion. The transnational Amazigh Movement does not call for a separate Amazigh state within North Africa; it calls for national recognition of the Tamazight language and culture at the national level, as a human right under the United Nations Forum for Indigenous Peoples (Becker, 2014, p.96). In linguistics, the Tamazight language is identified as Berber in the Afro-Asiatic family of languages. The Amazigh Movement is attempting to reclaim and consolidate a culture based on a common language. This is particularly challenging insofar as the Tifnaugh alphabet has been under-utilized, there is limited literary tradition. Only Morocco offers public school instruction in Tamazight. Consequently the cultural consolidation must focus on oral language. Amadiume’s thesis in Re-inventing Africa: Matriarchy, religion and culture (1997) is that there is a “missing system of matriarchy in European studies of African societies” and that this blindness is “the consequence of gender prejudice and ethnocentrism, as a result of the masculinization of language, and the imposition of the structures of Greek and Hebrew mythologies on Africa” (Amadiume, p.29). Linguist Fatima Sadiqi argues that Tamazight is undergoing a process of feminization because more women the language than men. Mothers are viewed as the keepers of the language for several reasons. They speak Berber to their children. More women are illiterate than men, and rely on oral communication. Women tend to be monolingual, while men become multi-lingual in the public sphere due to work and community. (Sadiqi, 2012, np). Sadiqi uncritically concludes that Tamazight is associated with private, domestic sphere, while Arab language is associated with the public sphere (Sadiqi, 2003, p.224). She makes an impassioned plea that scholars shed gender and class blinkers in order to value oral tradition as cultural knowledge, however I critique her crude dismissal of gender when she states that “the Berber female aspect of ancient Moroccan society became gradually engulfed in magic and saint veneration” (p.224). I suggest that Sadiqi has misunderstood honouring ancestors as “saint veneration” and indigenous spiritual rituals as “magic”. There is little evidence that she comprehends the matricentric foundation of Tamazight culture and its embeddedness in language. “if the Berbers loose their unique cultural identity, as a Berber, one may no longer wish to remain a Berber, since there will be no one in essence. To take away from indigenous people the values at the heart of their existence, rather than preserve their priceless world heritage, goes against all human ideals reverberating across the moral world. (Nesmenser, 2012, np). Nesmenser corroborates Haarmann’s theory that the essential values of a culture embedded in sign and symbol help a culture to survive. Cultural knowledge related to Tanit has become thin, however the symbols of Tanit’s primordial motherhood and functions continue to be embedded in Tamazight art. The visual arts have been an important instrument in The Amazigh Movement for raising awareness. As Tamazight identity and cultural knowledge continues to demonstrate its ‘usefulness’, this ancient culture can reclaim the values that are core to their identity and longevity: matriculture, peace, mutual care and deep connectedness to earth and sky. The resilience and adaptability of Tamazight people is evident when we consider that 5000 years of desertification could not destroy the core canon of useful knowledge needed to keep Tamazight culture functioning in the community. Several questions require further study. Why did ancient Egyptian civilization collapse but the Tamazight culture survived? Does a volatile arid environment contribute to greater resilience and adaptive capacity than a predictable fertile environment? How does a culture adapt to when indigenous cosmology contradicts the public symbology imposed by colonizers? Amadiume, I. (1992). Reinventing Africa: Matriarchy, religion and culture. London & New York: Zed. Bascom, W. (1984). The Forms of Folklore: Prose Narratives. In A.Dundes, Sacred Narrative: Readings in the theory of myth, pp.5-29. University of California Press. Bates, O. (1914). The Eastern Libyans (2013 ed). Routledge. Becker, C. (2009). Matriarchal nomads and freedom fighters: Transnational Amazigh consciousness and Moroccan, Algerian and Nigerien artists. Critical Interventions Fall. Becker, C. (2010). Deconstructing the History of Berber Arts: Tribalism, matriarchy and a primitive Neolithic past. In K.E.Hoffman & S.G.Miller (eds. ), Berbers and Others: Beyond Tribe and Nation in the Maghrib, pp. 195-220. Indiana University Press. Becker, C. (2014). Amazigh Arts in Morocco: Women Shaping Berber Identity. University of Texas Press. Berggren, K., & Harrod, J. (1996). Understanding Marija Gimbutas. Journal of Prehistoric Religions, 10, 70-73. Bernal, M. (1987). Black Athena: The Afroasiatic roots of classical civilization. Rutgers University Press. Birnbaum, L.C. (2001). Dark Mother: African origins and godmothers. Lincoln, NE: iUniverse. Brooks, N. (2005). Cultural heritage and conflict: The threatened archaeology of Western Sahara. The Journal of North African Studies 10 (3-4), 413-439. Claudot-Hawad, H. (2009). We are the shelter and the protection: the representation of gender among the Tuaregs. In H.G. Abendroth (ed. ), Societies of Peace: Matriarchies present past and future, pp.159-172. Toronto: Inanna. Dexter, M.R. (1990). Whence the goddess: A source book. New York: Teachers College. Diop, C.A. (1990). The Cultural Unity of Black Africa: the domains of patriarchy and of matriarchy in classical antiquity (3rd ed.). Chicago: Third World Press. Diop, C.A. (1974). The African origin of civilization: Myth or Reality (edited and translated by Mercer Cook). Chicago: Lawrence Hill Books. Dollinger, A.(2008). An introduction to the history and culture of Pharaonic Egypt. Retrieved from http://www.reshafim.org.il/ad/egypt/religion/neith.htm. Eichenlaub, C. (2000). Marija Gimbutas and the future of a legacy. The European Legacy, 5(5), 733-735. Gaster, T.H. (1984). Myth and story. In A.Dundes, Sacred Narrative: Readings in the theory of myth, pp.5-29. University of California Press. Giblin, J. (1998). Issues in African history. Retrieved from http://www.zyama.com/Iowa/African%20History.htm. Goodman, J.E. (2005). Berber culture on the world stage. University of Indiana Press. Retrieved from http://f3.tiera.ru/1/genesis/580-584/580000/09bb9b8cd8c9b628df255a978bd626cb. Goodman, J.E. (2004). Reinterpreting the berber spring: from rite of reversal to site of convergence. The Journal of North African Studies, 9(3), 60-82. Grasshoff, M. (2009). The central position of women in the life of the Berbers of Northern-Africa exemplified by the Kabyles. In H.G. Abendroth (ed. ), Societies of peace: Matriarchies present past and future, pp.178-192. Toronto: Inanna. Griffis-Greenberg, K. (1999). 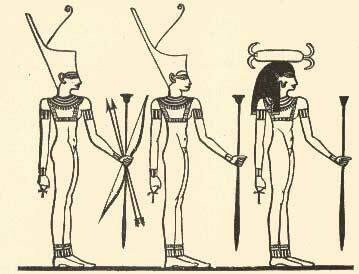 Neith: Ancient Goddess of the beginning, the beyond, and the end, in The guiding feminine: Goddesses of ancient Egypt. Retrieved from http://www.reocities.com/skhmt_netjert/Neith.html. Haarmann, H. (2007). Foundations of culture: knowledge-construction, belief systems and worldview in their dynamic interplay. Frankfurt, Berlin, New York: Peter Lang. Hvidberg-Hansen, F.O. (1986). Two Phoenician goddesses of fertility reconsidered from recent archaeological discoveries. In A.Bonanno, Archaeology and fertility cult in the ancient Mediterranean: Papers presented at the First International Conference on Archaeology of the Ancient Mediterranean, University of Malta, 2-5 September 1985. p.170-196. John Benjamins Publishing. Iles, L. (2007). Neith, Weaver of the Cosmos: Weaving in ancient Egypt. Retrieved from https://sites.google.com/site/isislotusofalexandrialyceum/neith-weaver-of-the-cosmos. Maddy-Weitzman, B. (2011). The Berber identity movement and the challenge to North African states. University of Texas Press. Nesmenser (2012). Temehu Tourism Services. www.temehu.com. Pöllauer, G. (2014). Amazon Research Network website: http://www.myrine.at/. Rigoglioso, M. (2010). Virgin Mother Goddesses of Antiquity. New York: Palgrave MacMillan. Sadiqi, F. (2003) Women, gender and language in Morocco. Brill. Sadiqi, F. (2012). Oral knowledge in Berber women’s expressions of the sacred. Global South Cultural Dialogue Project (GSP). Retrieved from http://globalsouthproject.cornell.edu/files/2012/09/Sadiqi-19yhrf1.pdf. Strong (2011). Review of Ritual theory, ritual practice by Catherine Bell. Retrieved from http://strongreading.blogspot.ca/2011/08/bells-ritual-theory-ritual-practice.html. Stuckey, J. (2009). Tanit of Carthage. MatriFocus 8:4. Tyrrell, W. B. (1984). Amazons: A study in Athenian mythmaking. Baltimore: Johns Hopkins University Press. Weinbaum, B. (1999). Islands of women and Amazons: Representations and realities. University of Texas Press. Winters, C.A. (nd). The Black Greeks. Retrieved from http://clyde.winters.tripod.com/chapter6.html. Winters, C. A. (1994). Afrocentrism: A valid frame of reference. Journal of Black Studies, 170-190.